It snowed here at our B&B last night–sometime after midnight when I was up greeting a guest. This morning we had a light dusting of snow. 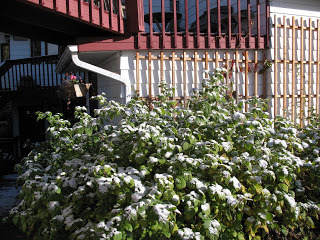 Craig took a picture of our raspberries with the snow. I am glad it took the picture this morning. The snow is gone now. I am sure that later this month we will have snow for the rest of the winter. Soon I will post several of the summer flower pictures. It was a great summer for our flowers! This entry was posted in Uncategorized and tagged Alaska fall by admin. Bookmark the permalink.